When we unite our suffering with the suffering Christ, we learn that it can be redemptive and fruitful as part of His salvific mission. 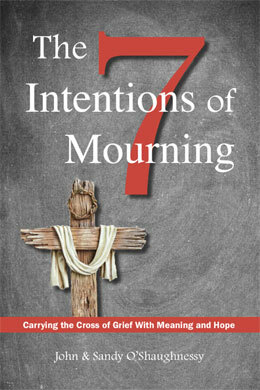 The Seven Intentions of Mourning are each conscious choices and together a unique pathway to healing where our grief finds a meaningful expression. Each intention is distinctly positioned to help us carry our personal cross of grief, as we discover that love endures all and that good can come from bad when there is hope. Eduardo J Echeverria, Ph.D., S.T.L.